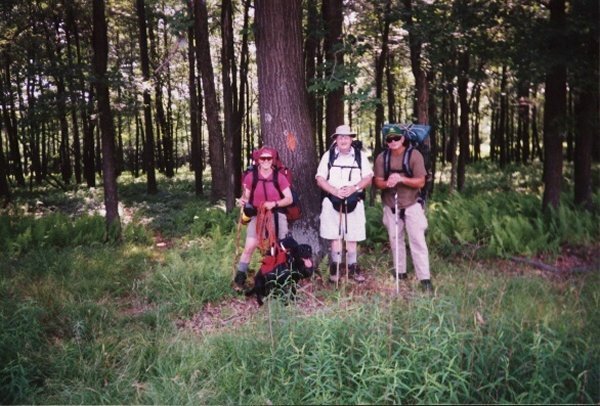 This 4 day, 3 night 30 mile linear backpacking trip took place during the July 4th long weekend of 2002. We hiked from the Quehanna Highway junction to Parker Dam State Park, PA. Participants were Terri Moore, Frank Maida, John Geisler and myself. at the park office, then went to see the western trailhead for this hike. We then went back to the office, where we met Terri M and John G. We placed John's car at the western terminous and shuttled Terri's and my car around to the eastern terminous where the Quehanna Trail crosses the Quehanna Highway just north of Piper, PA. The parking area is about a quarter mile north of the trail intersection with the highway. We finally got on the trail and walking west at around 4PM. The trail itself was fairly flat. The temps were in the high 80's low 90's that day, which would be the warmest one. There were some small ups but nothing difficult. We walked trail for a mile or so, a forest road for a couple miles, crossed a power line, then some more level hiking and finally a big down to a valley-like area called Corporation Dam where Mosquito Creek and Twelve Mile Run intersected. This is where we would camp the first night. This spot was listed as the second night if one were to do the entire 74 mile loop counterclockwise. We did just over 6 miles that afternoon. 7/5/2002- We had a good night's sleep and started out around 8AM the next morning. First thing we had a massive up to climb out of this valley that we had slept in. It was a killer. It made the rest of the day a very tough one. We hiked for 3 or 4 miles along a ridge, crossed a few power lines and got to what looked like the head waters of a small creek. The trail started looking the same for miles. Just trees and ferns with no real view. At one point there were 2 sets of blazes for about a quarter mile, the fresher set not really a trail but designed to bypass a huge blowdown. We ate lunch at Deserter Run, then started a difficult (though not as bad as earlier in the day) up. We then again did some level hiking and got to Gifford Run, which we would be parralleling for the next few miles. This stream was the color of ice coffee, having been laced with tannin from trees. It stunk as well. I was hoping that we wouldn't have to camp by and drink from this stream. We passed one clean tributary (which had a great campsite just before it), started a small up and then paralleled this foul creek along real crappy trail. It was up and down along the banks to avoid the rocks. Finally, it was getting late in the day and we were getting very tired. 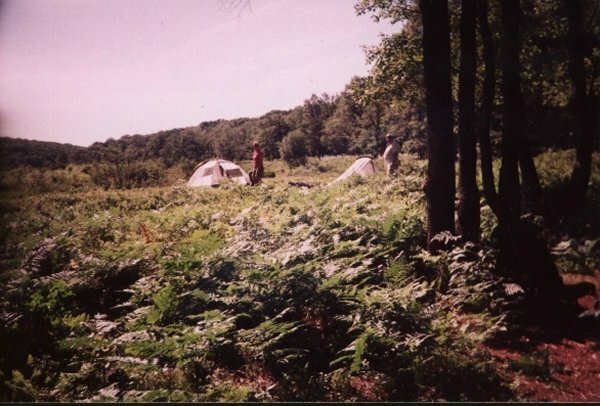 We came across a campsite just before crossing Gifford Run. We were facing another good sized up just ahead. So we reluctantly decided to camp at this stream crossing for the night after doing 9 miles that day. If you hike this section of this trail in this direction, DO NOT camp here. Go another 1.5 miles. You will cross a road and get to a stream and a spring where you can camp. This is where the guide book says to camp the first night if doing this trail in it's entirety counterclockwise. We didn't and paid for it. The campsites were so-so. We were kept awake by frogs, beavers and deer during the night. What was really bad was that we tried filtering this coffee colored water and managed to clog up 2 of the 3 water filters that we had. So this wasn't a good day. 7/6/2002- This would prove to be a better day. We started out at 7:30 AM that morning, did a medium up, crossed Caledonia Highway, then came across Deer Creek with good water and a spring that fed into it. 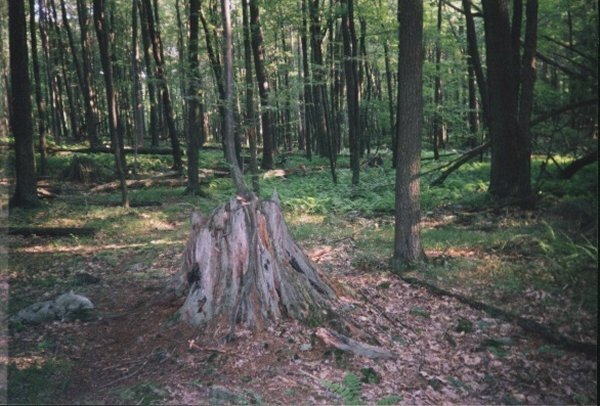 This is the suggested first night campsite when hiking this trail counterclockwise in it's entirity. We passed an old CCC camp, crossed Knob RD and did have a medium sized up that took us to a microwave relay tower and a very nice view of the surrounding mountains. We ate lunch there. We then did a big down, about 3 miles of level forest walking, then came across a beautiful meadow with a pond and nice views. We then climbed back into the woods, crossed a small clean stream, then polluted Robert Run. It had that brown stuff in it. Yuk. We then did a medium sized up, slabbed the side of a mountain, hiked though a level area with huge boulders, hiked the Good Year Railroad Grade, then crossed polluted Trout Run. We were worried about again having problems finding good water as it was mid afternoon. But we lucked out. When we reached Alex Branch the water was good and there were many good camp sites. So we camped at the first site there after doing about 10 miles. 7/7/2002- Again a nice peaceful night. This was the final day and the goal was 6 miles to get back to the car. It started sprinkling a little that morning but nothing else in the way of rain. We hiked along Alex Branch for a few miles, skirting a few hunting camps, passed the West Cross Connecter Trail, McGeorge RD and were again on the Good Year Logging Grade. This was a very pretty stretch with very level hiking for at least 5 miles. We crossed a polluted stream and then had an "opportunity". We were anxious to get off the trail. At one point the trail turned sharply north at the intersection with the CPL Trail. The guide book mentions "jogging right" to this trail when hiking the entire trail counterclockwise. What "jogging right" means, I'm not sure. But we decided to turn left onto this trail as it seemed to go towards the park. DON'T DO THIS if hiking this trail in this direction. This trail goes to Laurel Ridge RD. If one turns right, it deposits you on Mud Run RD just outside the park. We got about 3/4 of the way there and noticed that we were going away from the park on Terri's GPS. 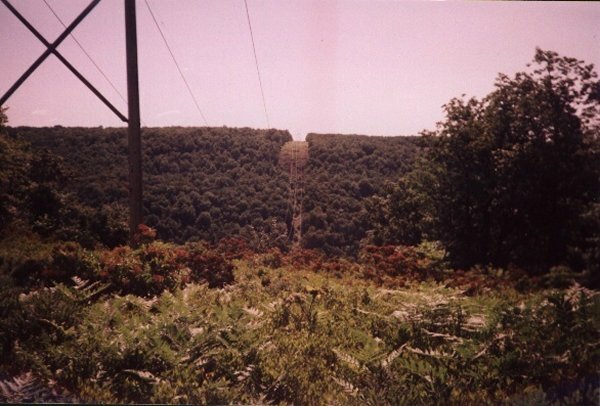 So we backtracked to a powerline crossing, where we thought that we saw the Quehanna Trail further up a hill. 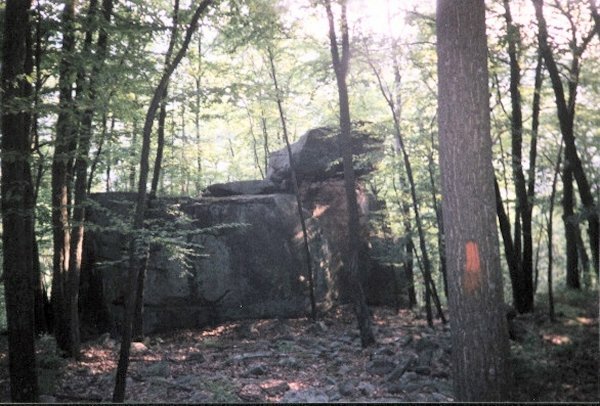 Terri hiked there and confirmed this. So we bushwacked the power line, got back on the trail and got back to the car around 12ish that day (we wasted an hour getting lost!). We then shuttled back to our cars at Piper by 1ish, went to a Texaco Truckstop with a great smorgesboard at I80 and PA879 around 2ish and got on the road by 3ish. The ride home was bad due to holiday traffic. But that's another story. This was a long but good hike. It got boring at times as you would see the same scenery for miles. But the vistas were pretty and some of the stream crossings were a real challenge. This trail is not used much as we only saw 2 "thru-hikers" over the July 4th weekend. Animals spotted included numerous deer, turkey, grouse, beaver and a garder snake. 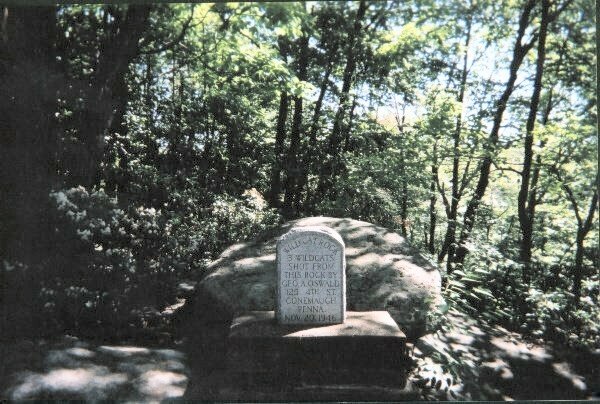 We plan to come back next year and take a week over the July 4th weekend to hike the remaining 44 miles of this trail. The occasional bad water and the long level stretches were the only real downers on this hike. 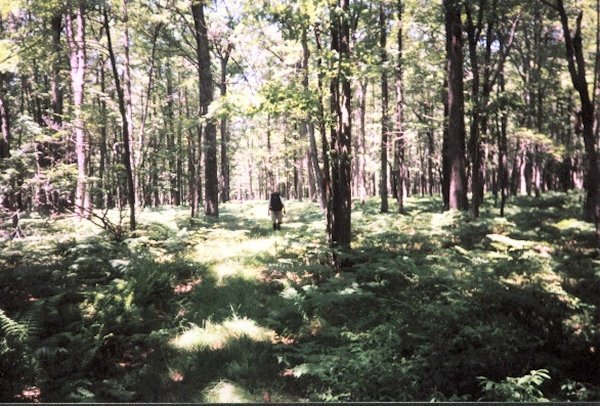 Other than that, the Quehanna Trail is a very nice trail along with it's surrounding side trails that will give one much solitude and many areas to explore. 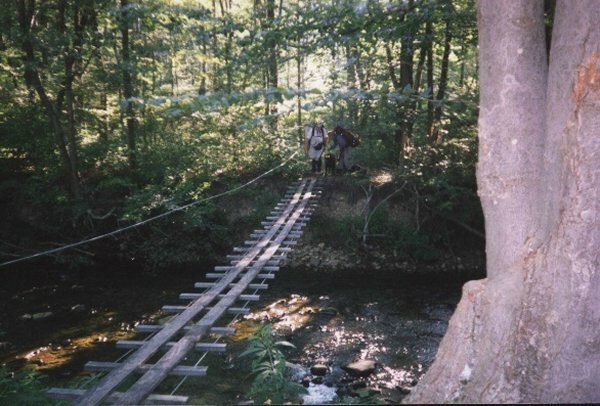 Swinging bridge at 7 mile mark. Tree growing out of a tree. At the 28 mile mark.